One of our board members had the privilege to meet Jim Covert on a TWF field trip. I asked Jim to share his interest in TWF’s water quality mission and he was kind enough to offer the story. “Back around 1910 my teenage grandmother and her family summered at Lake Tippecanoe, traveling on the Interurban from Indianapolis to Leesburg. She recalled paddling her canoe from Kalorama to Oswego to get milk and eggs. I imagine her experiences were the spark for my family’s return in the 50’s. I first came to Little Tippy in 1952 at the age of 5. My mother, grandmother and sister Susie, age 2, spent the next 6 summers next door to Camp Crosley while my father and grandfather commuted back and forth on weekends. Turtle hunting was my main occupation, supplemented by Indian crafts on the rainy days. My grandfather hauled my turtle catch to Murphy’s dime store in Indianapolis each week, paying me 10 cents each. My mother confided to me in later life that she thought my grandfather just dumped the turtles in the first creek he came to but I was none the wiser. Weekends, when my father and grandfather arrived, were a whirl of activities – fishing, sailing, surfboarding, skiing, guests and the best of all – sometimes a turtle hunting expedition down Grassy Creek with my dad – the big time!” “After a 15 year hiatus, our family reconnected with Lake Tippecanoe in 1983 and the lake once again became a family gathering place for my parents, my wife Dixie, our two young children, my sister’s family and guests. As with most lake families, the lake weekends were again all about extended family, water sports and of course, GRILLING. Whatever was going on back home in Indianapolis was forgotten. 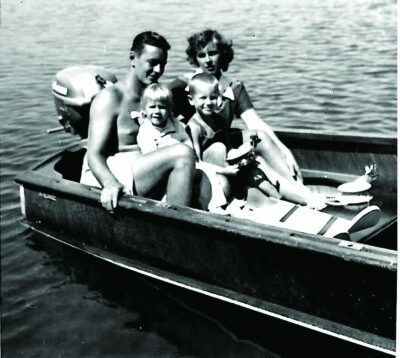 We now have a new generation – our three young grandchildren – to whom we are eager to pass along our family traditions of lake life. I have watched the lakes change dramatically since 1952. Back then, reeds rose above the water in front of our cottage, in front of the Crosley woods and, of course, in the Tippy flats. The water was clear. Large mussels, frogs and small snails were in abundance and we had natural sand beaches along our waterfront on the east shore of Little Tippy. A scant 60 years later, all of this is nearly gone. Weeds now cloak formerly clear wading areas. Pontoon boats clog the Crosley woods shore. The reeds are long gone. The deeper areas of the lakes no longer support fish due to a lack of oxygen. Apparently over these years little thought was given to the causes and inevitability of the changes occurring in our lakes and watershed as boats became more powerful and plentiful, lawns became fertilized and manicured, seawalls replaced beaches and farmers used more and more fertilizer, pushing for ever higher yields from their fields. I want to thank the Coverts for all that they do for TWF. I am sure we all have stories very similar to the Covert’s. If you would like to join Jim and Dixie and so many others who support TWF, please contact Lyn Crighton, Joe Tynan or any TWF Board member or visit our simply website to learn more about how you can help make a difference.